Knee stretching should be done on a regular basis to maintain their mobility. Tightness can develop in cases of disuse, sedentary lifestyles, arthritis, and poor posture. While we can often function with reduced mobility, it is the pain associated with the muscle imbalances and joint dysfunction or irritation that brings people in to the physical therapist eventually. Stretching exercises as part of a regular exercise program can help prevent injuries and maintain painfree function. Why Should we do Stretching for Knees? What are the Muscles that Cross the Knee? How can knee stretches prevent injury? The knee acts as a large hinge joint as it becomes straighter. When collateral ligaments are looser as in the flexed position, a certain amount of rotation occurs of the tibia on the femur through the pull of the medial or lateral hamstrings. For optimal function of the knee we require a balance of the length of the muscles around it between flexors and extensors. We also need a balance in strength. When there is an imbalance it can predispose you to strains, ligament sprains, and joint wear. Exercise is a necessary part of any treatment plan for arthritis. The type, intensity, and frequency of exercise you do will depend on the type of arthritis you have and the condition of your joints. As part of the inflammatory process the body lays down scar tissue. This scarring creates adhesions around the joints, pain, and dysfunction. Because of the pain, inactivity typically ensues leading to further stiffness and weakness. To break this cycle you need to see your family physician about methods to control the inflammation and your physical therapist to prescribe an exercise program appropriate for your needs. Knee stretches ares especially beneficial for arthritic knees. Although you cannot reverse the damage that has been done to the cartilage you can reduce the pain due to capsular tightness and painful adhesions that are associated with arthritis. By restoring mobility to the arthritic knee you help normalize the mechanics and reduce the wear and tear that accelerates the degenerative process. Dealing with osteoarthritis is a balancing act between exercise and rest. Exercise too much or too vigorously you can aggravate your pain; exercise too little, and weakening and instability results, worsening joint wear and tear. If you suffer from arthritis of the knees be sure to have it evaluated by your physical therapist for an appropriate set of exercises to address stiffness, weakness, balance, and endurance. There are several ways to stretch the hamstrings. The way I usually tell patients is in standing so as to minimize strain on the lower back. The standing stretch is valid as an effective method of increasing hamstring flexibility, but depends on pelvic positioning. If you are able to maintain a straight lower back while performing this stretch it is significantly more effective. 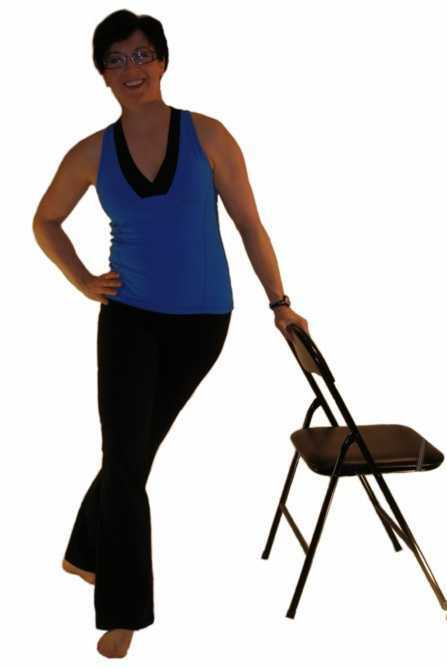 To perform this stretch stand and face a chair or table. For more hamstring stretches see the page on Stretching Hamstrings. Kneel onto your right knee and place your left foot in front of you to assume the lunge position. Long adductors can also be stretched in sitting. This stretch also includes hamstrings biasing the medial hamstrings, semimembranosus and semitendinosus. Slowly work your legs apart as far as they will go. Hold this and relax for a few seconds. Most people will gain a benefit from 30 seconds. The part of the calf that originates from above the knee is the gastrocnemius muscles. It crosses both the knee and the ankle joints. The iliotibial band is a long thickening of the fascia on the outside of the thigh. It originates from the Ilium and inserts into the tibia. It receives muscular attachments at the hip and has slips into the patella so you can see how tightness in this structure could cause a whole slew of problems. Any good knee stretching program should include IT band stretches. For a more detailed discussion on the iliotibial band and more ways to stretch it see my page on The Iliotibial Band. To stretch the right iliotibial band in standing, stand with your right side facing a wall or leaning on the back of a chair. Joint position sense otherwise known as proprioception is important in sports and knee function in that it is a contributor to joint stability. Results showed that a knee stretching program that included three static stretches of 30 second duration improved people's joint position sense. Knee stretching used in the study targeted the quadriceps, hamstring and adductors. A study published in The Journal of Athletic Training analyzed the incidence of lower extremity strains in players of a Division 3 college football team over 1994-95. (5) The addition of a knee stretching program in 1995 resulted in significant reduction in strains that required minimum 1 day of play lost in 1995 over 1994. 2. Knapik JJ, Bauman CL, Jones BH, Harris JM, Vaughan L. Preseason strength and flexibility imbalances associated with athletic injuries in female collegiate athletes. Am J Sports Med. 1991;19:76-81. 3. Jonhagen S, Nemeth G, Eriksson E. Hamstring injuries in sprinters: the role of concentric and eccentric hamstring muscle strength and flexibility. Am J Sports Med. 1994;22:262-266. 4. Worrell TW, Perrin DH, Gansneder BM, Gieck JH. Comparison of isokinetic strength and flexibility measures between hamstring injured and noninjured athletes. J Orthop Sports Phys Ther. 1991;13:118-125. 5. KM Cross, MEd, ATC; TW Worrell, EdD, PT, ATC Effects of a Static Stretching Program on the Incidence of Lower Extremity Musculotendinous Strains knee stretching. Journal of Athletic Training 1999;34(1):11-14.